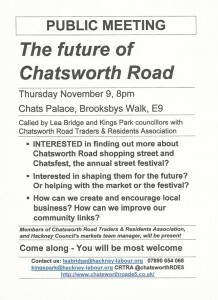 Lea Bridge and Kings Park councillors will be at Chats Palace on Thursday 9 November to answer your questions about Chatsworth Road or other local matters. There will also be representatives from the council’s market team. We’ll also be there – CRTRA – so it’s a chance to find our more about the market, street and Chatsfest as well as how you can get involved. Free and open to all we hope to see as many as you of possible make it along.